The next president needs a strategy to end the pernicious influence of money on our political system. Here’s mine. Earlier this week I launched a committee to explore the possibility of running in the Democratic Primary to be a very different kind of president. As I explained then, the run would be a referendum around a very simple idea: that if, as Elizabeth Warren puts it, “the system is rigged,” then we need a plan to fix that rigged system. My plan is a referendum. My candidacy would be a referendum. Elected with a single mandate to end this corrupted system, I would serve only as long as it takes to pass fundamental reform. I would then resign, and the vice president would become president. And it’s obviously true: Sanders has spoken repeatedly about the corrupting influence of money in politics. He has joined the call for an amendment to overturn Citizens United, he has amended his original promise to change the way elections are funded “in the long run” to a promise now to “move toward” that critical reform apparently more quickly. No one can mistake who the enemy in Sanders’ narrative is: those with the money, who use that money to block critical reform, and corrupt this democracy. But “a clear statement” is not a plan. It’s a wish list. And this wish joins seven others on Sanders’ issues page. Two days ago, it was number 8. After my announcement, it moved to number 2. But whether 8 or 2 or number 1, it is just one issue among the many that Sanders is selling a desperate and eager public. And when framed as just one among many, it presses an obvious question: What reason is there to believe that Sanders could get a sufficient mandate to pass this essential reform against the most powerful interests in this democracy? Because remember—“the system is rigged.” And if it’s even possible to overcome the powers that have rigged this system—not an assumption that’s easy to make—it’s going to take much more than just one wish among many. It’s going to take a plan to make this change the first change the next administration tries to make, after a campaign in which it is clear to all that this is what the people have demanded. Reform can’t be just one idea on a list. It can’t be something you talk about achieving “in the long run.” Nothing that you’re talking about doing is credible unless you achieve this reform first. What you need to do clearly is to demonstrate convincingly how you’re going to achieve at least the corruption, and voting parts of your program as the first thing you do. This is important both politically and for credibility. Politically: every Democrat is going to be talking about basically the same issues. You need to distinguish yourself from them by describing a credible plan to make certain these changes happen first. Credibility: after the surge of support for you, the single strongest attack is going to be the “reality argument.” You’re talking about a string of reforms that simply cannot happen in the Washington of today. The “system is rigged.” If that rigging is good for anything, it is good for blocking basically everything you’re talking about. The only response I’ve heard you give to that is that you’re beginning a revolution—making it sound like the mechanism of change is a bunch of people in the streets of D.C. Whether you believe that is possible or not, other people won’t. Indeed, talking like that only weakens your credibility. The only credible way to talk about why you will get the change you want where no one else has or could is because you have a plan for making sure the “unrigging” of the “rigged system” happens first. If you have a convincing and credible plan for that, then the other changes you’re talking about don’t sound like mere fantasies. Citizen equality can’t just be one issue on a list. It has to be the first issue—the one change that makes all other changes believable. For the first time in forever, The Wall Street Journal reports this issue is at the top of voters’ mind. You need to be the leader who makes it top of your platform as well. We’ve returned yet again to the vigorous game of fantasy politics. We get excited by ideas that deep down we know just cannot happen. We let ourselves pretend, because what else are we supposed to do? Presidents are important even if this corrupted system makes it impossible for them to address the most important problems sensibly. There is a “dime’s worth of difference” between the candidates and the parties. So we forget that the system is rigged, in order to muster the passion to get the best we can, given a rigged system. I think we need to aspire to more. I think we need a plan that could get us a democracy again. I think we need a strategy that would make it even just plausible that the next president could have mandate enough to take on this corrupted system. We need to give the people a sense—a real, and true sense—that there is a way for them to reclaim this democracy. We need a strategy that does more than make us look like Charlie Brown, with Lucy holding a football. That is what I have tried to do with the plan for a referendum president. That president would have a single mandate. That mandate may well be enough to get a reluctant Congress to act. That chance is why I have risked the obvious criticism of launching a “quixotic” quest to trigger a chance to recover democracy. Because, obviously, I understand this idea is something new. Obviously, I recognize, politics is the field where the new is scorned viciously—until it has won. But good souls have been fighting this issue for literally 40 years, and yet the problems have only gotten worse. What we need now is a willingness to try something different. Because the same is obviously not working. Regardless of who the next president is, he or she deserves a Congress free to lead, because America deserves a representative democracy. That is what this campaign can achieve. 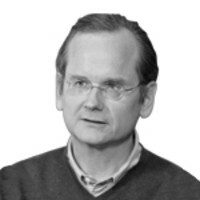 Lawrence Lessig is the Roy L. Furman Professor of Law and Leadership, Harvard Law School and the director of the Edmond J. Safra Foundation Center for Ethics, Harvard University.